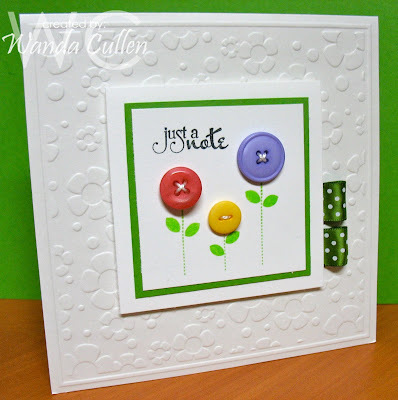 Angella Crockett is the talented stamper featured this week on SCS...check out her awesome gallery HERE. 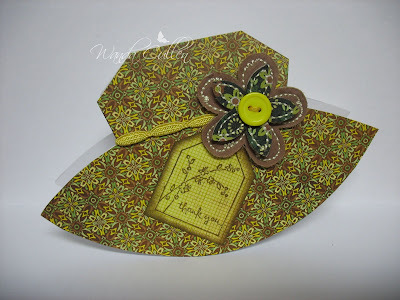 Angella's gallery was FULL of wonderful cards...but I finally decided on this one to CASE and used different papers, changed the ribbon treatment and added a flower to the corner instead of a flourish. I associate Angella with ODBD (where she is on the DT), so knew I wanted to use one of the 2 sets I own from that company. I can't seem to stop using the Origins DP from BasicGrey with the matching bloomers! TFL! 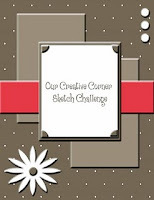 OCC has a sketch challenge for us this week...check it out! This is a great way to use up some scrap DP that accumulates. 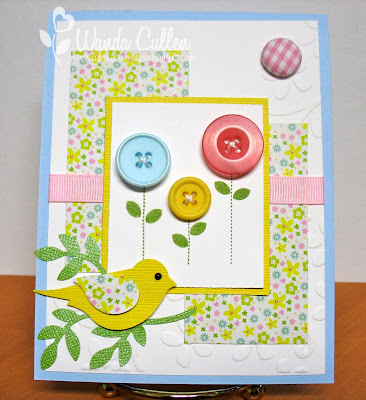 Love this new bird punch from SU - so many different combinations can be made! It's been an enjoyable day with visits from our daughter from college and our drummer/pizza making son who lives an hour and 15 minutes away. Enjoy your w/e! 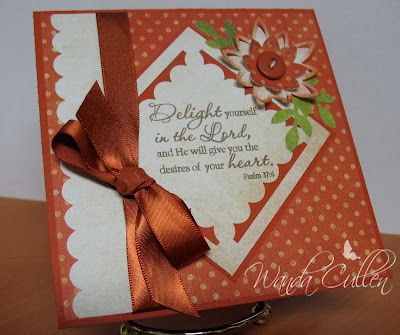 Our Daily Bread Designs Shining Light Challenge #4 was to think outside the box with our cards. 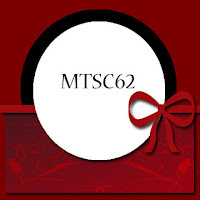 I searched for a hat template and found this card in the SCS gallery. I then sketched a template (approximately 5 1/2 x 3 1/2 inches) and first cut out a folded piece of white CS, then cut the shape out of DP, added ribbon, flower & tag sentiment. 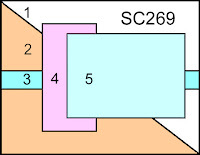 Quick and easy (once you have the template drawn :-). 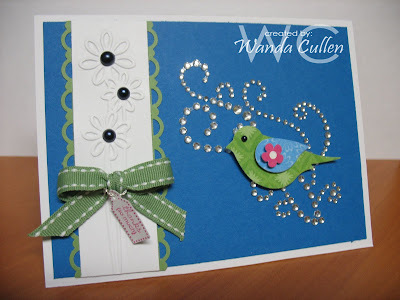 The new SCS Friday challenge will be a 'Free For All' & our first time requirements were to use textures (I used bling, dry embossing, pearls, ribbon, punched border), one color we don't normally use (I used Pacific Point) & patterned paper was optional (my bird is punched from DCWV Blossoms & Butterflies stack). 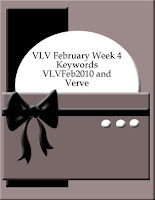 I combined this with Stef's challenge to be inspired by Olympic ice skaters' uniforms. I chose the gold medalist from South Korea (Yu-Na Kim) with the vivid blue and the bling embellishments. 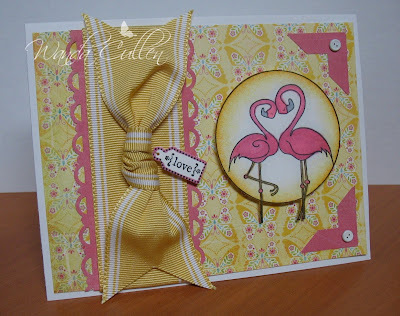 The sentiment is from the adorable tiny tags set in the SU Occasions mini catalog. 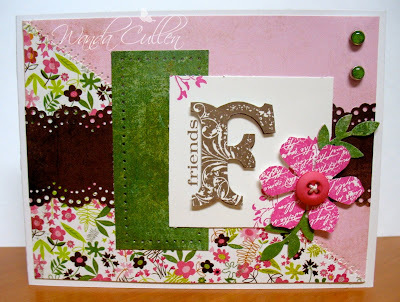 My card combines 3 different challenges: Color Throwdown Challenge (to use brown/pink/white/olive), SCS sketch challenge from yesterday, & today's challenge by Julia to use lace. I immediately thought of the sultry DP by BasicGrey for the colors. 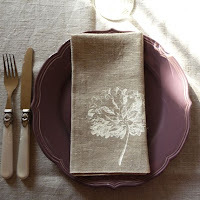 My lace element is using the Doily Lace punch by Martha Stewart. 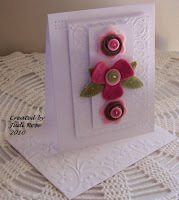 The flower was stamped using Pink Passion, cut out & popped w/dimensionals. The leaves are punched using SU's large bird punch. I ziz-zag stitched using my Janome sewsing machine. 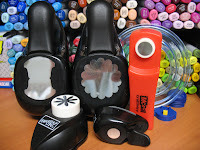 I missed my stamping fix yesterday due to working out frustrations with changing my blog background and header. It's still not exactly what I was aiming for but it will do for now. :-) Thanks for stopping by...I really enjoy your comments! Betty's color challenge on SCS was to use any or all of the colors in the Olympic logo along with a neutral(s). I used 4 colors with one neutral (white) so that makes this an Event 4 card. The 'dessert' was to include a metallic (either gold, silver or bronze) so I chose silver pearls as an accent. 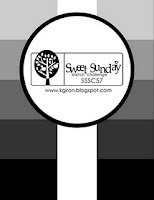 The layout is Mercy Kerin's Tuesday sketch and it was a great one to ink up one of my all-time fave SU stamps! 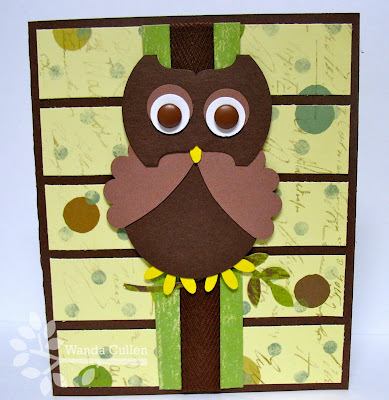 This was a quick and easy card to create...it's past my bedtime, so will say good night! This was a quick card for 2 different challenges. ODBD asked that we acknowledge & CASE a crafter we admire and change only 2 elements. 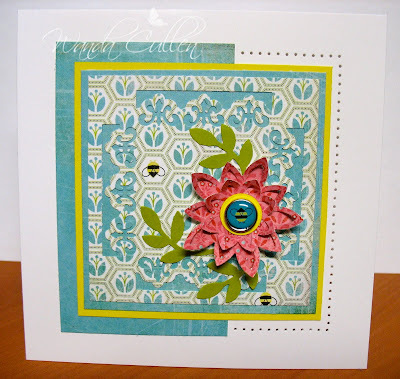 Silke Ledlow is one of my fave stampers of all time! She's a master at using white spaces, balancing all elements, does fantastic coloring...I love everything she creates! I didn't do her card justice (that's what happens when you do something in a hurry)...should have added a white layer in the center of the square. :-( I combined this with Our Creative Corner's challenge to try a new technique. I had done a scallop medallion a LONG time ago, but thought I'd try a newer punch and see what happens. I started with a larger square (3 1/4 inches) then punched the fleur de lis design on all 4 sides. 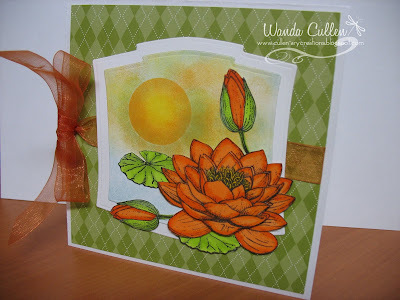 I just had to play with my new Martha Stewart punches (Pop Up Water Lily) to create the dimensional flower. Leaves are also punched. I want to try this again on a solid color...the pattern got lost in the DP design. I'll add a sentiment as the occasion arises. Gotta run to work...hope you're enjoying your Saturday! In addition to papercrafting, I also enjoy floral arranging. I've never had formal training (unless you count belonging to a junior garden club in middle school), but somehow I've picked up tips through books, magazines, etc. A friend asked me to arrange some silks for her mother who is in a nursing home. 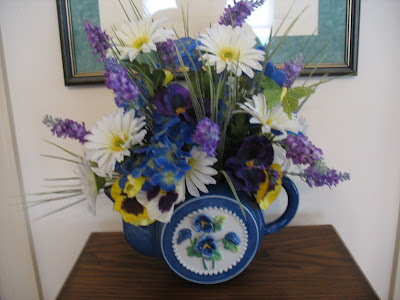 She got this adorable teapot with fresh flowers and kept it with the dead flowers for so long that finally her daughter asked if I would arrange something she could permanently enjoy. So this is the result. Hope she will enjoy it! My parents are snowbirds who go south for the winter and spend it in sunny Florida. One of my favorite memories of visiting them was a visit to Jungle Gardens where I was fascinated by the prissy, tame flamingos who happened to be enjoying their mating season at that time! They were quite entertaining (and noisy!). Ahh...but I'm digressing. 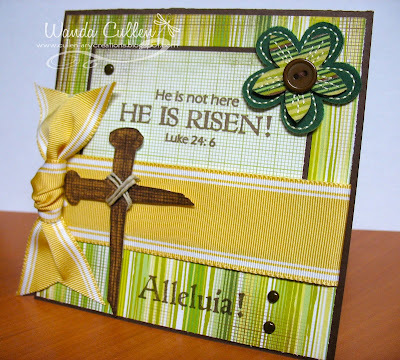 This card combines the OCC challenge to use something we bought eons ago and never used (the wide saffron ribbon) with the Limited Supplies Challenge on SCS which was to use ribbon and a border punch (trim) on a card. I finally inked up this new image from Taylored Expressions and colored with Copics, then sponged the circle with Yoyo Yellow & Only Orange. I then cut it out & popped it with dimensionals. I added the tiny love tag and will most likely give this to my parents for their anniversary in May. TFL! 'Orange' you glad you stopped by? It's Wednesday, so that means it's Color Throwdown time! This time we were to use burgundy, rust & a light green. No matter how hard I tried to come up with a springtime card, my mind always went to 'fall'. No problem...now I'm way ahead of the game with an autumn appreciation card (maybe pastor appreciation in October?). I love Waltzingmouse stamps that match Nestabilities, so I first cut the Labels Four shape, then stamped in Mellow Moss. The tag and popped leaves were sponged & popped with dimensionals. Some score lines at the top and some large scallop punches & pearls at the bottom finished it off. A sink full of dirty dishes is calling my name...TFL! Winter Wonderland...a front porch view!